It's holiday time again! I don't know about you, but I can't think about the holidays without all those mouth-watering baking aromas wafting through the house. Sometimes, I like to make brownies to give to friends and family, figuring they're probably up to their eyebrows in cookies already. And brownies are pretty versatile, too. You can make basic ones that can be mailed to a lucky recipient, or push the envelope and make a luscious, gourmet treat to serve at home. When baking brownies, it's important to slightly underbake them. All varieties of brownies have the best texture when they're just slightly underbaked. You'll know they're done when the edges are just beginning to pull away from the sides of the pan. The usual tips you use to check if a cake is done don't apply to brownies. For example, the top of your brownies shouldn't be springy to the touch, and a toothpick should come out with plenty of crumbs sticking to it – not clean as it would be for a cake. The first two recipes are good for mailing if they'll be delivered within several days. Wrap individual brownies in two layers of plastic wrap, then in aluminum foil. If you're packing them in a tin, cushion with layers of bubble wrap. For more packing and shipping info and tips, you might want to check out my Special Delivery article from last year. 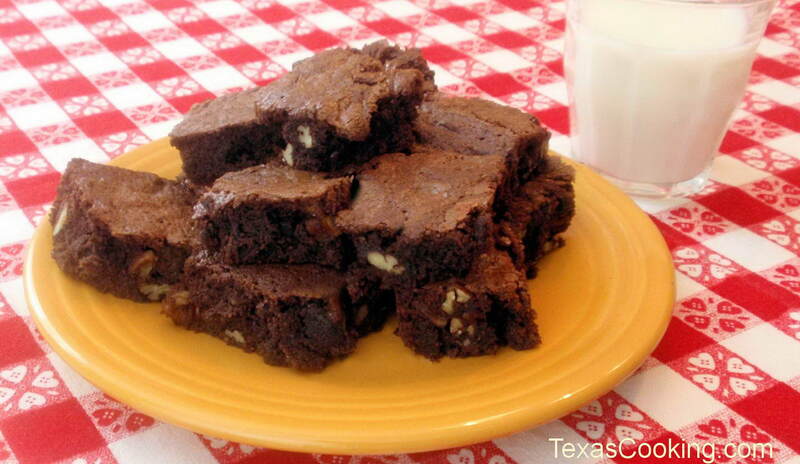 These are my favorite brownies. They're quick and easy to make, plus you don't have to go through all the bother of melting chocolate because you're using cocoa. (I prefer the taste of cocoa, anyway). Preheat oven to 350°F. Grease a 9x9-inch metal baking pan. In a 3-quart saucepan, melt butter over low heat. Remove saucepan from heat. Stir in sugar with a wooden spoon. Stir in eggs, one at a time, and vanilla until well blended. In a medium bowl, combine flour, cocoa, baking powder, and salt. Stir flour mixture into saucepan until blended. Stir in nuts, if desired. Spread batter evenly in prepared pan. Bake 25 minutes, or until a toothpick inserted 2 inches from the center of the pan comes out almost clean. Cool completely in pan on wire rack. When cool, cut into 4 strips, then cut each strip crosswise into 4 pieces. If you haven't had rocky road brownies since you were a kid, what better time than the holidays to bake up a batch? Kids and grandkids will love them, too. Preheat oven to 350°F. Grease a 9x13-inch metal baking pan. On waxed paper, combine flour, baking powder, and salt. In a 3-quart saucepan, heat butter and chocolate over medium-low heat until melted, stirring frequently. Remove saucepan from heat. Stir in sugar and vanilla. Add eggs and stir until well mixed. Stir flour mixture into chocolate mixture just until blended. Spread batter in pan. Bake for 20 minutes or until toothpick inserted 2 inches from edge comes out almost clean. Sprinkle top of brownie evenly with marshmallows and top with nuts. Bake 5 minutes longer or until marshmallows melt slightly. Cool in pan on wire rack. When cool, cut brownie lengthwise into 4 strips, then cut each strip crosswise into 6 pieces. Makes 2 dozen brownies. I know that many of you can't start the day (or get through the day) without your coffee. Make a batch of these to enjoy with your favorite coffee drink. Preheat oven to 375°F. Grease a 9x13-inch baking pan. Melt the chocolate and butter in a medium saucepan over low heat, stirring to blend. Remove pan from heat. With an electric mixer, beat in espresso powder, sugar, eggs, and vanilla on medium-high speed until sugar is dissolved. Beat in cinnamon, flour, baking powder, salt, and nuts just until mixture is combined and smooth. Spread into prepared pan. Bake for 25 minutes or until a cake tester or toothpick inserted near the center comes out with a few moist crumbs attached. Cool completely in pan on a wire rack. In a small bowl, beat butter with an electric mixer until light and fluffy. Add sugar, espresso powder, vanilla, and brewed espresso, beating until smooth. Frost cooled brownies. Refrigerate for 30 minutes. Cut into bars. Makes 3 dozen brownies. This is a gourmet brownie, for sure. Like the song that Donny and Marie Osmond used to sing (I'm showing my age here!) about being "a little bit country, a little bit rock 'n' roll," these are a little bit brownie and a little bit cheesecake. They take some time and effort to make, but you won't regret it. Unfortunately, they need to be refrigerated, so you can't mail them. Oh, well, you'll just have to eat them yourself. In a medium bowl, using an electric mixer, beat together all the ingredients until smooth. Preheat oven to 350°F. Line a 9x13-inch baking pan with foil. Lightly grease the foil. Melt the butter with the unsweetened and semisweet or bittersweet chocolates in a medium saucepan over low heat until mixture is melted and smooth. Remove pan from heat and whisk in cocoa and vanilla. Whisk sugar and corn syrup into the butter-chocolate mixture until smooth. Add eggs and egg yolk, whisking until smooth and glossy. Stir in flour, baking powder, and salt, combining until smooth. Gently stir in the white chocolate pieces. Spread one-half of the brownie mixture in the prepared pan. Drop tablespoonfuls of one-half of the cream cheese mixture on top of the brownie mixture. Lightly spread the remaining brownie mixture over the top. Drop tablespoonfuls of the remaining cream cheese mixture on top and gently swirl both mixtures together using a knife or spatula. Bake brownies for 30 to 40 minutes or until a cake tester or toothpick inserted in the center comes out with a few moist crumbs attached. Don't overbake; brownies will be too dry! Cool pan completely on a wire rack. Once brownies are cool, cover pan with foil and refrigerate overnight before cutting. When ready to cut, grasp both ends of the foil and lift brownies out of the pan. Invert, gently peel off the foil, and then turn brownies right side up. Cut into squares. Tightly wrap and refrigerate any leftovers. Makes about 2 dozen brownies.